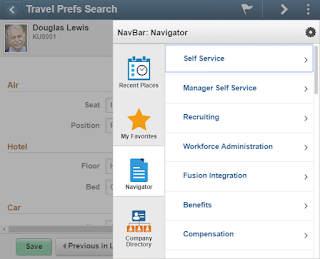 Jim's PeopleSoft Journal: Do I have to use the Navigator? These customizations seem quite valuable to anyone that uses the Navigator. And who doesn't use the Navigator? It is the primary delivered navigation method for Classic content. But are we really supposed to depend on the Navigator? If so, should these customizations be incorporated into the product? Or are we missing the point of Fluid navigation? Does Fluid provide an alternative? Let's start with a review of Self-Service. 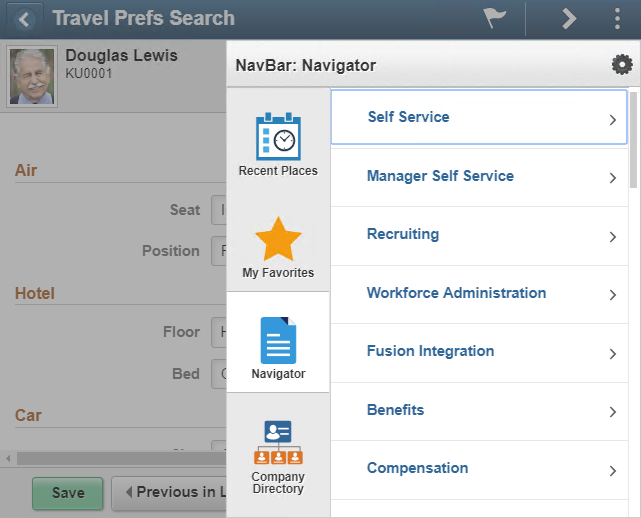 With a complete Self-Service Fluid rollout, do you need to use the Navigator to launch any Self-Service functionality? No. Every Self-Service transaction is available from a tile. Consider Personal Details. 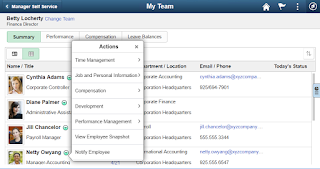 When an HCM Self-Service user launches Personal Details from a tile, PeopleSoft opens a WorkCenter-like experience, allowing the user to navigate through the Personal Details components using a left-hand sidebar. Again, did we need the Navigator for any of this functionality? No. But that was Fluid. What about Classic? 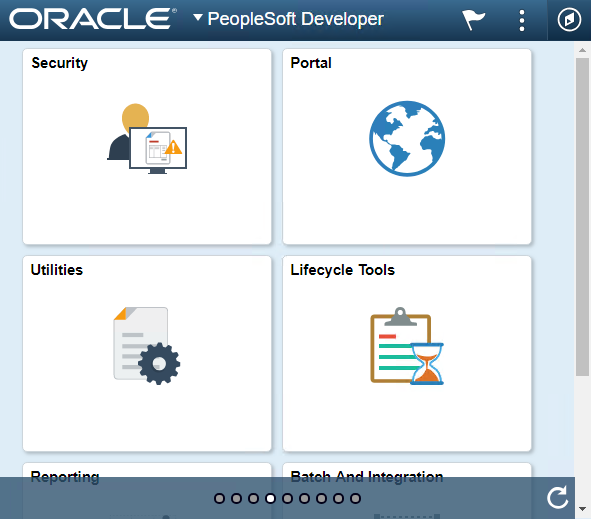 In PeopleSoft HCM PUM 29 there are 400+ Fluid components and nearly 7,000 Classic components. How would you navigate to those 7,000 Classic components without the Navigator? Classic components predate Fluid and therefore aren't represented by tiles. Imagine if they were? How many homepages would you need to house 7,000 tiles? How many tiles would you have per homepage? Too many! So we use the navigator... but wait! Many of these options are configurable and do not require Application Designer (Developer not required). Here is how I believe Fluid navigation should work. Keep in mind that Fluid navigation spans both Classic and Fluid components. Fluid navigation is not just for Fluid Components. Homepages should be role based. My homepage collection should depend on the hats I wear in my organization. Within each homepage, I should have business process-based tiles. These tiles should launch WorkCenter-like Navigation Collections, Activity Guides, and so on. For example, if I am a PeopleSoft developer, then I should see a tile for managing security. 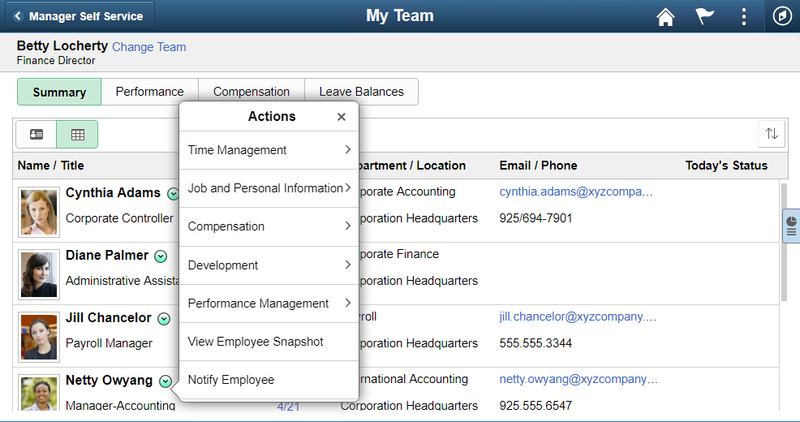 When launched, that security tile will display a left-hand panel for navigating within the Security business process. 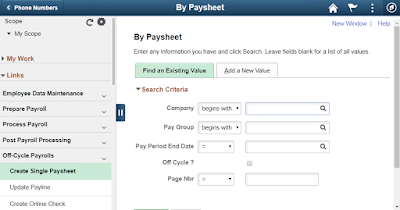 If I manage payroll, then I might expect to find a tile labeled "Payroll WorkCenter USA" that includes navigation for all of the components associated with the Payroll business process. Remember, the items in the left-hand sidebar of a Navigation Collection or WorkCenter may be a combination of Classic, Classic +, and Fluid. From certain transaction pages, I should see Related Actions that allow me to drill from one transaction to a related transaction. Done right, 95+% of my work will launch from tiles. The Navigator becomes my safety net. I reach for the Navigator once a year or every few years to complete some obscure configuration task reserved for implementation. What about the Navbar? We often think of the Navbar as an intermediate step used to launch the Navigator, but the Navbar is a homepage of tiles. Instead of a container for the Navigator, the Navbar is an always-present homepage with tiles I can launch from anywhere in PeopleSoft. Let's say you work in Procurement and often answer questions about Purchase Orders. You have your regular buyer and procurement duties, but you must be ready at a moment's notice to answer a question or solve a problem. To prepare for the inevitable interruption, you add your most common inquiry business process tiles to the Navbar. You are now two-clicks from the answer to any question. Now I ask you, "if you never use the Navigator, do you still desire a customization to automatically expand the Navigator when opening the Navbar?" I think not. How did we get here? I believe we are in an intermediate navigational state. Classic used breadcrumbs. 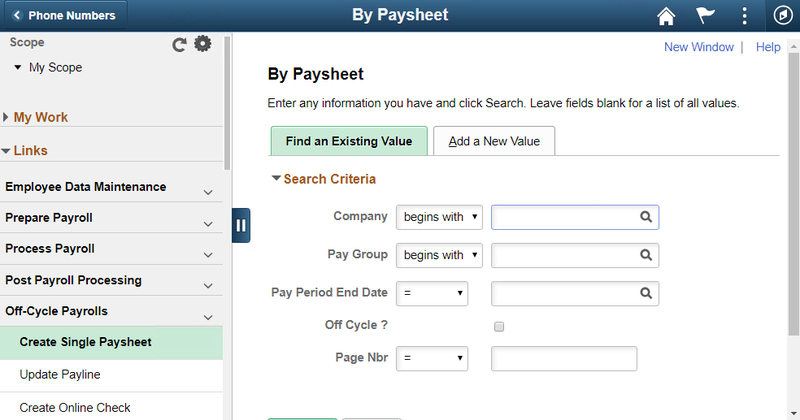 Fluid uses business processes. I believe the problem is that our Classic content was moved into the Fluid navigation paradigm (PeopleTools 8.55) without usable business process maps (Navigation Collections, WorkCenters, and so on). We, therefore, must build our own business process maps using Fluid navigation tools to align Classic content with Fluid navigation. Building navigation is a critical phase of any Fluid implementation. Get it wrong and you may find yourself rolling back Fluid in favor of Classic (no joke, I have seen this before). When implementing Fluid we often focus on Self-Service, and rightly so. Self-Service comprises the majority of our headcount. 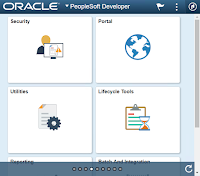 But often Self-Service users are a minority of our actual time spent using PeopleSoft. Oracle has done a great job of building Fluid navigation for Self-Service users. What's missing? Fluid navigation for Classic. Today that is our job. As developers and business analysts, we must build that missing business process based navigation for our back office users. We believe that navigation is a critical component to a successful Fluid implementation and that is why we devote the first day of our Fluid 1 course to Fluid navigation. To learn more or to schedule a course, visit us online at jsmpros.com. Jim - great summary, exactly the way we have implemented Fluid. Suggest everyone spends some time right now getting your support/project teams to setup NavColls/Homepages in prod and non prod, so they can reap the benefits and then set them up for all users. Have you done any experimenting by either creating a whole new EC (Fluid) Workcenter, or adding new 'My Work' items within an existing EC (Fluid) Workcenter? PeopleBooks has nothing and I've raised a SR but not getting much back. @Banksy, Yes I have created a new Fluid Enterprise Component WorkCenter. Creating them is a little odd because you are supposed to clone a delivered component, register it, and then set CREF attributes. You may then use the Enterprise Components item to "configure" the new WorkCenter. I have not looked into Filters or My Work yet. I was also able to get a fluid Workcenter loading by cloning objects and poking around in structure and content. Without 'My work' links it's just a navcoll really. If you have some spare time, see how far you get with creating a 'my link', I think you will enjoy the challenge! Hi Jim - great summary of the options and challenges. At A&O a lot of work was done to setup homepages/tiles to ensure our users never need to use the navigator, and at a previous place I worked we removed it completely for self service users. 1. When building something new that requires a lot of different config screens (eg Fluid Forms and AWE Approvals), and which we will be using a lot, I created a developer homepage and added a tile for quick navigation for this area. This was then migrated to production in a regular release. I'm expecting/hoping we add more navigation to this homepage as we need it. 2. Browser Bookmarklets! I created a page that allows me to quickly "Save as favourite" any PeopleSoft page I am on, the favourite being a bookmarklet that will open that page in any PeopleSoft environment. As a tech I use bookmarklets for 90% of my navigation. I can create them in seconds whilst I am in DEV and know they are available in any environment without the wait for a refresh. If I am working in a particular functional area I can create the bookmarklets I need for that project, then delete them/move them to a folder when I don't need them any more. They can also be shared fairly easily if needed, although others tend to create their own if they need to.